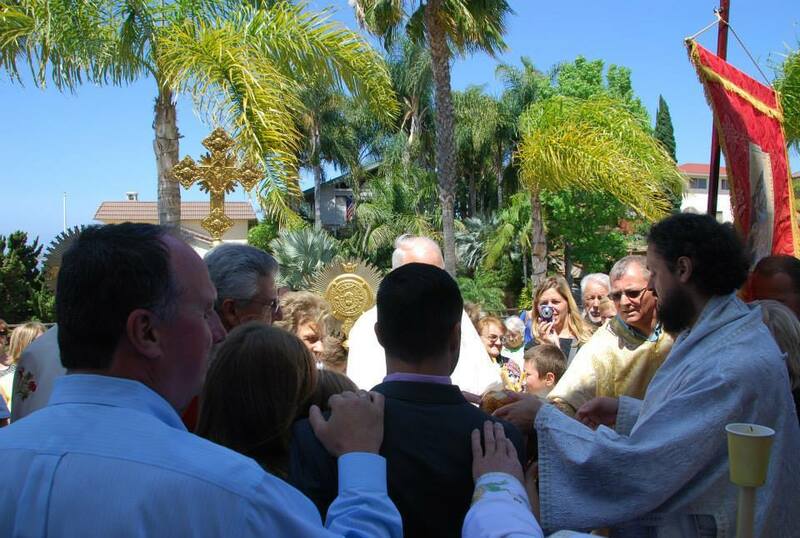 San Diego, CA - On Sunday, May 4th, 2014, with the Hierarchical Divine Liturgy, the parish in San Diego celebrated the Sunday of the Myrrh-bearing Women and their Church Slava – Parish Patronal Feast Day of St. George the Great Martyr. Though the Feast Day of St. George falls on Tuesday, May 6th, the parish according to established practice celebrates their Church Slava on the Sunday closest to the actual Feast Day. His Grace Bishop Maxim served the Hierarchical Divine Liturgy with concelebrants: protopresbyter-stavrophor Velimir Petakovic, protopresbyter-stavrophor Bozidar Draskovic, both former parish priests, protopresbyter Bratislav Bratso Krsic, the parish priest, Deacon Paul Germain, parish deacon, in the presence of many parishioners and the faithful from other Orthodox parishes of the San Diego area. Protopresbyter-stavrophor Milan Vukovic, parish priest at the neighboring parish of St. Petka in San Marcos, joined in the celebration later during the banquet and program. On the third Sunday of Pascha according to the Orthodox liturgical calendar we commemorate the Myrrh-bearing women who brought ointment and spices to anoint the body of Christ and to finish the final acts of customary burial tradition. Among those women were: Mary Magdalene, Mary, the Theotokos (the Virgin Mary), Joanna, Salome, Mary the wife of Cleopas (or Alphaeus), Susanna, Mary of Bethany, Martha of Bethany. Besides the myrrh-bearing women on the third Sunday of Pascha we also commemorate: Saint Joseph of Arimathea and Saint Nicodemus. The Matins service preceded the Liturgy. Following the Liturgy, a customary Lytia, (procession around the church) was made with prayers for St. George community, living and departed parishioners, the city and the country, for God’s continued protection and blessing over them. The blessing of the Slava kolach took place after the Lytia. The Kum and Kuma for the Church Slava were: Mr. Vojkan and Nada Popovic. Later during the program, Kum Vojkan conveyed his greetings and expressed his thanks for the honor of being Kum asking the parishioners to continue supporting St. George parish and her renovation project. His Grace Bishop Maxim in his sermon explained a deep spiritual meaning of the third Sunday of Pascha calling the faithful to continue offering their oil of good works, faith and sacrificial love just as the holy myrrh-bearing women did. He then added that to minister to the Lord is the most rewarding and uplifting service that we can do as the members of His Church. The program in the social hall during the banquet was inspirational facilitating encouragement to the faithful to continue building up parish ministries and the community of St. George the Great Martyr. Miss Oksana Germain and her beloved sister Kaija Germain, Deacon Paul’s and Natalija’s daughters, performed a selection of songs and piano opuses. Mr. Rankin Fisher entertained guests with his selection of Serbian and Russian songs. Mr. Nemanja Selazan, the president of the Church Board, thanked the capable kitchen crew led by his mom, Mrs. Jelica Selezan, for preparing the delicious Slava food. At the conclusion of the program, the parish priest Fr. Bratso called his parishioners to more actively participate in the Liturgical life of the Church and the educational and philanthropic ministries established in the parish and diocese. The program was closed with singing of Svjetisja, Svjetisja Novi Jerusalime… (Shine, Shine…) and the blessing of His Grace Bishop Maxim with farewell greetings.